She didn't suffer. During Tuesday night my mother fell asleep and passed away. In the end it all happened quicker than we all, including my mother, had expected. I wasn't able to say good bye to her as I had thought, yet at the same time we had our good byes over the past months. She was first diagnosed with pancreatic cancer in September 2006, at first we thought we only had a few months left. Luckily we had much longer than we thought back then. My mother shared my love of Islay with me (and my sister). She had always shown a lot of interest in our interests and activities and gave us a lot of support in them. When she retired in July 2003 from working as a primary school teacher I invited to a holiday in Scotland including a visit to Islay and she was hooked. So she returned in 2004 for the second WalkIslay walking week. It didn't work out during 2005 and 2006, so when the chemotherapy worked very well in late 2006 and early 2007 and the doctors gave their green light the four of us went on a family holiday on Islay in June. We went walking, we visited beaches and distillieries, we enjoyed good meals and the odd wee dram together. A holiday which gave her and us a lot, a lot of strength and a lot of great memories. During that year my father also took my mother to Switzerland, they visited my sister in Heidelberg, they went away for a long weekend to Bielefeld for my mother's birthday, just to name a few activities they were still able to undertake. Thanks to the internet we could communicate a lot despite living quite far apart, occasionally having three way calls with my sister in Heidelberg, me in the UK and my mother in Bremen. We had a nice Christmas together with the whole family, the second after initially thinking we had at best one left. In short, we were able to do quite a lot in the time we had left. In particular from late February this year her health really started to deteriorate, in March she went to hospital for treatment of some of the symptoms returning home in the second half of March. We even started to discuss possible plans for her to visit me in a new home near Reading, although we had to abandon those by the end of the month. 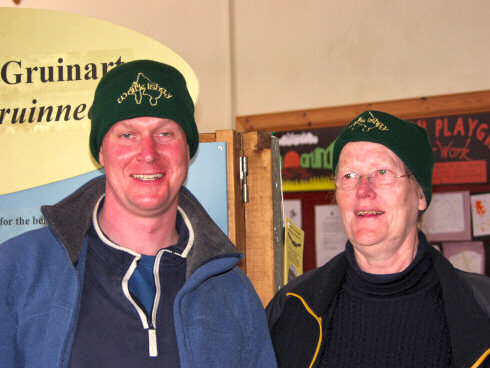 In early April she encouraged me to go to Islay, to attend the walking week. It was important for her that I went, knowing how important the week is to me, so I don't regret going. We spoke on the phone several times while I was on Islay and we were planning my visit after my return. During the night before the day I was due to arrive, with her mind still strong and waiting for me, her body just couldn't hold out any more and she peacefully fell asleep. I've only just realised that I in a way was watching over her during her last few weeks and final moments. It might sound strange, but this somehow means something to me. She will live on in my memory, the good times and bad times we've had together. The support she gave me during so many times in my life, at school, university and during my work life. I hope I've been a good son to her and gave something back to her, especially over the last year. A number of people on Islay have known my mother from her visits, quite a few of her illness and have and given me as well as my father and sister a lot of support, I'd like to thank you all for the kind words and support. It's been a huge help during these difficult weeks and in particular now. I will take a break from blogging here for a few more days while remembering my mother, then slowly start returning to ‘normal’ as would have been my mothers wish. She used to read this blog as the first thing after switching on her computer every day.